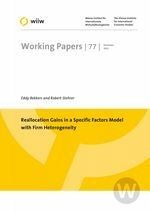 We study firm heterogeneity in a specific factors model to address the effect of factor mobility on reallocation gains from trade. A model is proposed with Melitz-type firm heterogeneity with two sectors, two countries and two fixed factors and one factor mobile across sectors. Equilibrium in each sector can be concisely represented by a demand and supply equation and an FE and ZCP condition. Varying the substitution elasticity between the fixed and mobile factor, we show that the welfare gains from trade liberalization are larger in countries with lower substitution elasticity. Furthermore, it is shown that the immobile production factor in the comparative disadvantage sector can still gain from trade liberalization due to the reallocation effect.